Today we’re excited to announce the launch of our $1M BAT giveaway so our users can support their favorite sites and content creators. Please read the press release below for details and claim your grants today! Note: if you’re not seeing the grant offer in your browser, simply disable and re-enable Brave Payments. SAN FRANCISCO, January 17, 2018 — Brave Software, a start-up building a new browser and a blockchain-based digital advertising platform, announced today that it is giving away $1 million in promotional Basic Attention Tokens (BAT) on a first-come basis. 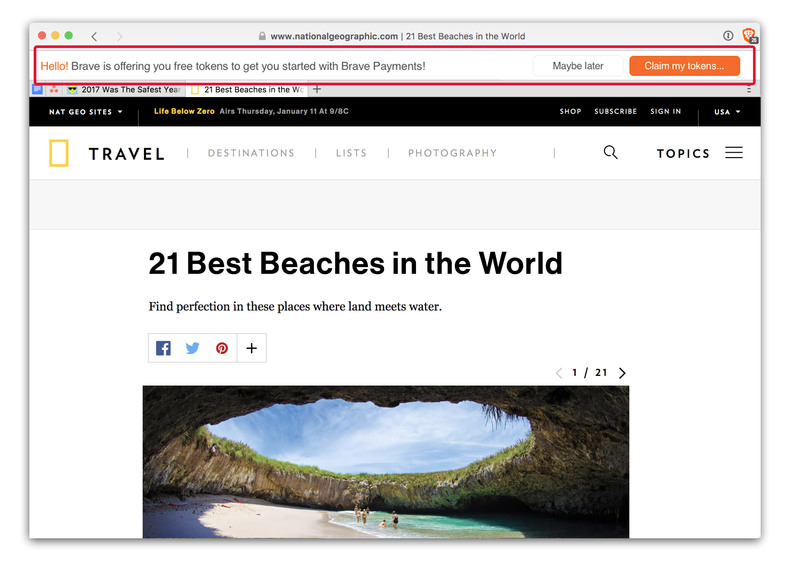 Browser users can claim the grants to support their favorite websites, content creators, and YouTube channels via Brave Payments. Each grantee will receive approximately 5 USD in promotional BAT (which must be used within 90 days) from the User Growth Pool (UGP), a fund of 300 million tokens set up to incentivize users and publishers to join the decentralized BAT platform. By spurring greater use of the BAT platform, the grants are a core part of improving everyone’s Web experience through Brave. Users receiving the utility tokens will enjoy a faster, more private, and secure browser that provides a built-in method of supporting content creators. Publishers, websites, and YouTube channels that receive tokens from Brave users will open a new means of monetizing content amid declining ad revenues, increasing ad fraud, and arbitrary demonetization campaigns. Ultimately, publisher and user adoption should continue to drive greater utility for the BAT. The grant program builds on Brave’s previous token giveaway. About a month ago, Brave granted $50,000 worth of BAT to approximately 10,000 users. All those tokens were claimed within 30 hours. The programs promote the use and growth of the Brave platform. Publishers and creators are adopting the solution at an impressive rate. Over 1,700 YouTube creators registered to receive tokens since Brave announced that users can give tokens directly to their favorite channels in November. There are also over 2,500 websites that verified or are in the process of verification, bringing the overall number of Brave Publishers to over 4,000. Brave is experiencing strong growth with over 1 million active users and over 4 million downloads. This $1 million promotion equates to approximately 200,000 user grants. The last promotion was over within hours, so we encourage users and publishers to act quickly. The BAT grants must be used within 90 days to support publishers and creators, otherwise they will automatically return to the BAT UGP. The promotion is intended to allow users to reward their favorite creators. Brave wallets are currently unidirectional, meaning that the tokens cannot be withdrawn and can only be given away to creators. Users who wish to fund their wallets with tokens after this promotion finishes can refer to our guide for help; we hope this promotion will help Brave users see how simple and rewarding it is to automatically and anonymously support the content creators they care about. The tokens for this promotion will be released from the UGP, which was created during the sale of the utility tokens in May 2017. The UGP consists of 300 million tokens set aside to incentivize users to join the Brave platform. We anticipate distributing promotional BAT to current and new Brave users over the next 90 days, but may end the promotion at any time. The approximate 5 USD worth of promotional BAT is set at the time of this announcement. We will try to maintain the grants as close to 5 USD as possible, but variability may occur.